This is the fifth instalment of the AMWN Showcase. Read more about the biodegradable bag and other case studies in the AMWN’s “Strategy for Marine Waste: Guide to Action for Africa”. One of the reasons single-use plastics are particularly problematic is because of the length of time they take to degrade. It is estimated that plastic bags may only be used for an average of 12 minutes, and straws 20 minutes, before being discarded. But, a plastic straw can take up to 200 years to degrade, while a standard plastic bag can take anywhere between 10 and 1000 years to disappear. Many of these discarded single use products end up in landfills and contaminate the environment. What if we could engineer plastics that degrade quickly? 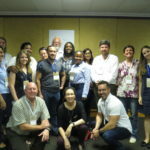 The potential of such a product to assist in solving waste issues would be enormous. 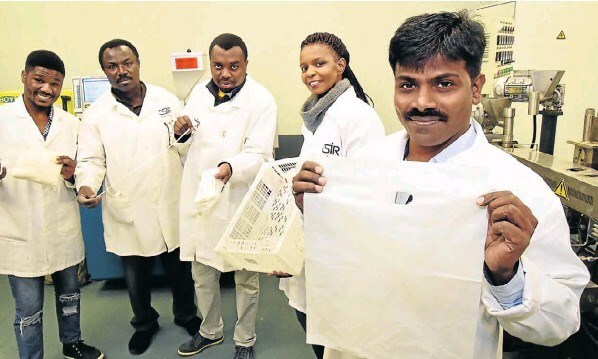 In fact, we can make such a plastic: Dr Sudhakar Muniysamy and his research team at The Council for Scientific and Industrial Research (CSIR) have developed a 100% biodegradable plastic material made from organic materials that is both reusable and recyclable. And, it degrades completely in just 3-6 months. What’s the big deal about biodegradable plastics? Biodegradable plastics may be the new material that could allow us to continue using useful single and short term use plastic products, but circumnavigate the environmental problems caused by our addiction to the convenience of single-use plastics. To explain how, let’s first look at how petroleum plastics are made. Petroleum based plastics, the most ubiquitous type of plastic to feature in our daily lives, are made from crude oil. Plastic is a carbon-based “polymer”, meaning that it consists of a long chain of smaller molecular units linked together. To make plastic, oil is refined into petroleum to obtain “monomers”, small molecular units which are then linked together to form a polymer chain. Plastic polymers are usually non-biodegradable, meaning that they do not come apart easily. That means when you throw plastic away, it very slowly breaks up into smaller pieces without degrading back into its constituent molecules (like carbon), and remains intact at microscopic scale. These plastic pieces can have a range of negative health and environmental consequences for both humans and animals. Biodegradable plastics, as the name suggests, are capable of biodegradation, meaning that they are easily disintegrated through natural processes like bacteria and other living organisms. 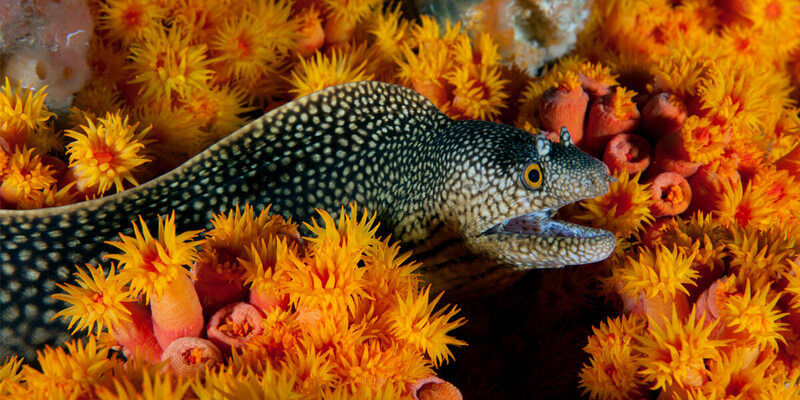 They break down into carbon dioxide, water and other minerals, thereby avoiding pollution. However, a word of caution; plastics labelled “biodegradable” aren’t necessarily better for the environment. Many plastic products labelled “biodegradable” will quickly break up into smaller pieces, giving the appearance that they will eventually disappear. However, all these products essentially do is break up into microplastics faster than normal plastics. Additionally, other “biodegradable” products may only break down under very specific conditions – for example in industrial composters at temperatures as high as 60 degrees Celsius – conditions rarely met in natural environments. Bioplastics avoid these issues by being generally both biodegradable and environmentally friendly. Dr. Muniyasamy’s products are made from bioplastics, meaning that the plastics are created from completely renewable and natural elements. Natural “biopolymers”, abundant in nature, can stand in for synthetic petroleum polymers and be sourced from various plant and animal materials. As Dr. Muniyasamy puts it, “Nature has everything”. Dr. Muniyasamy and his team source their biopolymers from agricultural byproducts – sugarcane and maize stalks that at present are only used for limited low value applications such as the creation of bioenergy. Since the material is readily available and sourced from annually renewable feedstocks, there is therefore no need to cultivate land specifically for the production plant materials for biopolymers. This method effectively acts to “close the loop” on these agricultural products, enabling zero waste generation during production, thus fulfilling the key objective of a circular economy. 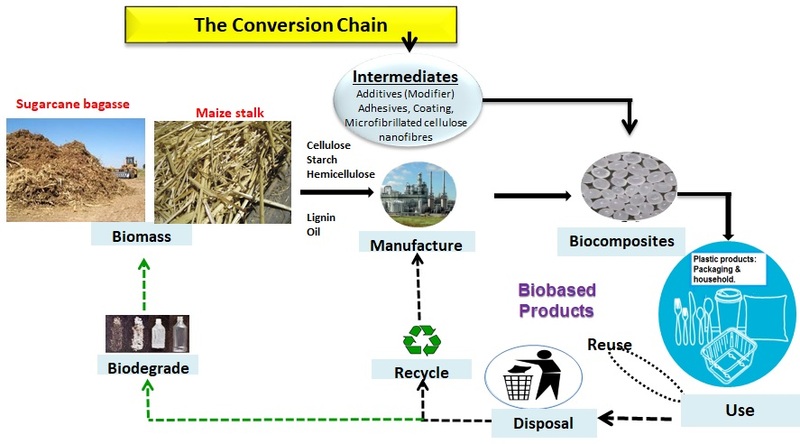 Image: A diagram of the lifesycle of the CSIR bioplastic. Credit: Dr. Sudhakar Muniyasamy. Biopolymers are extracted from plant material and then, using a process similar to the manufacturing of petroleum-based plastics, are made into bioplastic. The difference is that products made from bioplastics are 100% natural and biodegradable. Muniyasamy’s team produces fruit crates and bioplastic carrier bags and test their products in the laboratory to check their degradation ability. Their products have been shown to biodegrade in a range of environments, including soil, home compost, and marine water. Top image: Muniyasamy’s bioplastic film degrading in soil. 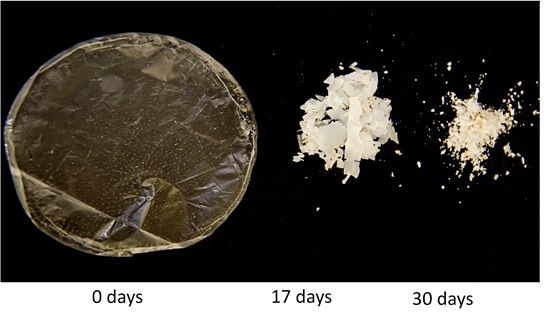 Bottom image: Muniyasamy’s bioplastic film degrading in seawater. 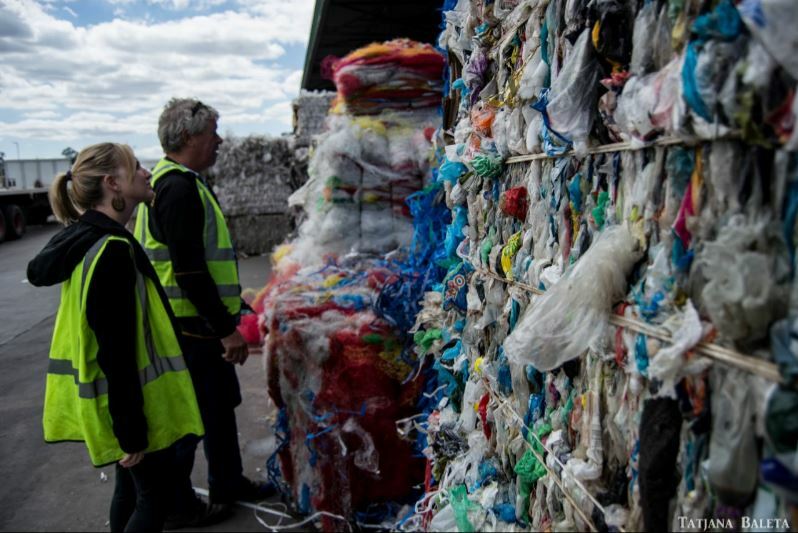 Will this affect the recycling industry? Muiniyasamy and his team were motivated to provide a solution to plastic pollution. They examined which single-use items are the main culprits creating pollution and targeted those in their research. Looking at overall plastic production in the world, as much as 50% is for packaging, 20-25% being flexible packaging (eg: food wrappings and films). In particular, Dr. Muniysamy focussed on creating bioplastics for items where “recycling is not possible”. Far from putting the recycling industry out of business, Muniyasamy’s bioplastic is both reusable and recyclable. The only catch is that petroleum and bio- plastics need to be recycled separately, due to the materials having different chemical structures and therefore different melting points. But Muniyasamy has thought this one through: “We need to develop a new recycling number that identifies biodegradable plastics,” he says. He envisions products designed with visible information and instructions on them to inform consumers about the biodegradable plastic. 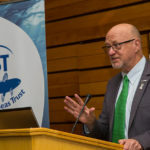 He is currently engaging with Plastics SA, Packaging SA and SABS (South African Bureau of Standards) to develop this as well as education and training programs for the general public and the recycling industry. Currently the retail price for these bags would be three to five times more than normal plastic bags, but with an upscaling in production, the price would decrease to a similar level as petroleum-based plastic bags. Image: Muniyasamy’s bioplastic products, left: fruit crate, right: carrier bag. If bioplastics are so beneficial, why aren’t they already in international use? 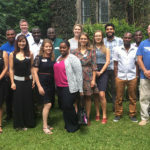 Bioplastics research has been happening across the globe for some time now, with different research groups focussing on different materials, for example, cassava root and even shrimp shells. One of the drawbacks of biopolymers is that they make for good thin films, like plastic bags, but not for rigid materials. In particular, international companies are working on changing the physiochemical properties of bioplastics (for example molecular weight, strength, elasticity, stiffness) so that they may be used in a wider range of industrial applications. Many European countries including Italy, Germany and the Netherlands, as well as other countries including USA, Japan and Thailand are already producing bioplastic products. However, these are mainly intended for degradation in industrial composters, which we lack in Africa. To create bioplastic products for use in Africa, products must be designed with African contexts in mind. However, aside from Muniyasamy’s group at the CSIR, there is little of this research happening on the continent. Dr Muniyasamy also emphasised that there are currently no standards in Africa to regulate whether or not a plastic alternative can be truly defined as “biodegradable”. 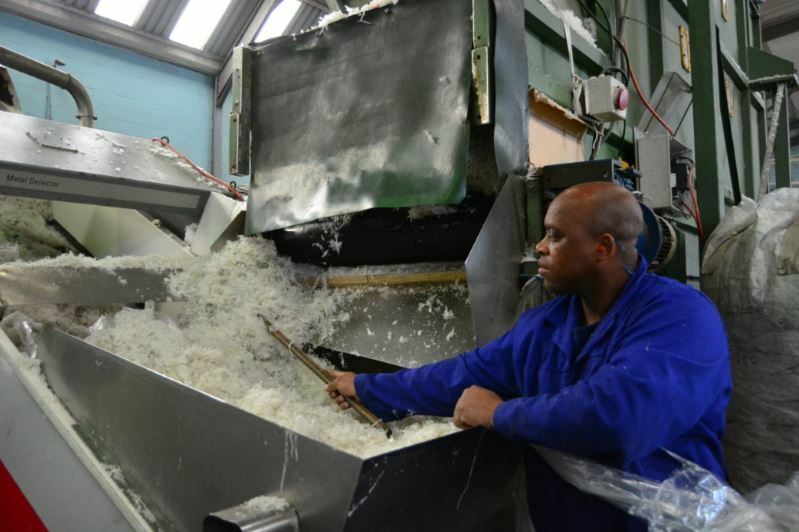 Developing our own standards is paramount; “So, if I’m claiming my material is completely biodegradable it will be tested according to the standard – what environment, how long does it take [to degrade]; whether it can be claimed to biodegradable or not”, he says. These standards can also be applied to other nations wanting to export their technology into African countries. How soon till we have biodegradable plastics on our shelves? 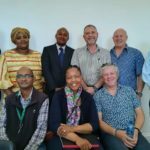 With the proof of concept completed by CSIR, the project is currently in the process of upscaling, determining bioplastics demand in South Africa and gaining licensing for production. There are many logistical tasks yet to be completed, but Muniyasamy believes we’ll be using 100% biodegradable, locally made plastic bags in another two to three years’ time. Dr Muniyasamy is also currently in communication with a variety of African countries who have partially or completely banned plastic bags including Kenya, Tanzania, Egypt and Namibia, and hopes that the new biodegradable bag will fill the niche for cheap, light weight carrier bags. As his material can degrade in natural, African environments, we may soon see Muniyasamy’s biodegradable bag tackling the waste crisis in Africa head on. For more information for an advanced reader, read this paper: “Environmental performance of bio-based and biodegradable plastics: the road ahead” published in ChemSoc Review, published 25th September 2017.